The coat rack dilemma! It's a real problem and this one is kind of the ultimate solution! It takes up hardly any space and has a huge impact that is oh so sleek. See for yourself! I love a good coat rack. In the corner or the entryway, it's a fun and useful accessory! Here are 15 of my faves around the web that you can BUY or DIY! Now that I live in a place where the weather changes from sunny to drizzly to bone-soaking-wet and back again multiple times in a single day, I'm thinking it might finally be time to get proper coat rack. This wood and copper version is really catching my eye at the moment -- plus it's a cinch to make! Sibylle from Funkytime knows the way to my heart: gleaming copper and smooth-as-butter concrete! The two materials just contrast so perfectly, ya know? I'm especially loving how she's combined them in this super functional DIY coat rack. If floor space in your entryway is at a premium, try this simple hanging coat rack idea! I stumbled across this Ready-Made submission that Das rote Paket received for a competition they were running. It's cheap, cheerful and quirky, key ingredients for my kind of DIY. With our warm winters, we don't have a need for a coat rack. In fact, the coat closet in our condo is home to our camping gear because the very idea of having designated square footage for coats is silly when it is 72 degrees outside (which did make for an awkward situation when we had people over for dinner and they handed me their light jackets... I just stood there like an idiot holding them instead). Even so, this fun idea doesn't take up storage space, and is pretty fun to look at too. 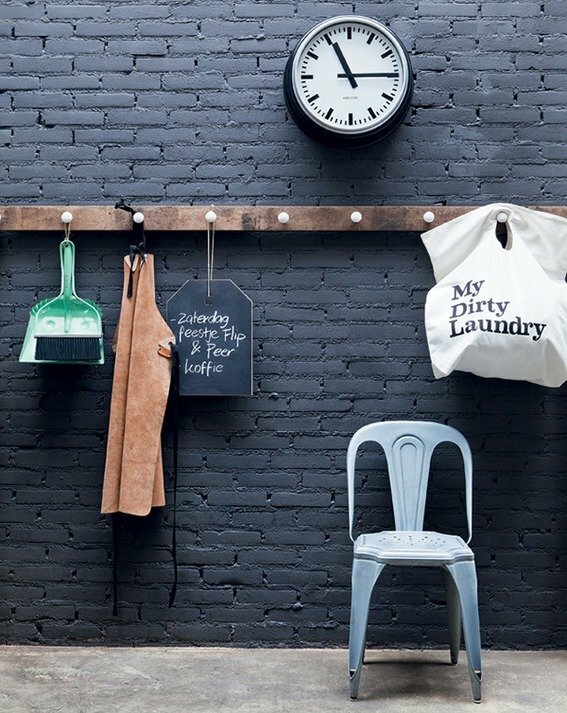 Until my dream of living in a Scandinavian Modern cabin comes to fruition, I'll just be content with simple flourishes of inspired decor and accessories like this rustic modern coat stand. It's a gorgeous little piece that packs a big ol' Scandinavian punch - and its DIY rating is off the charts.